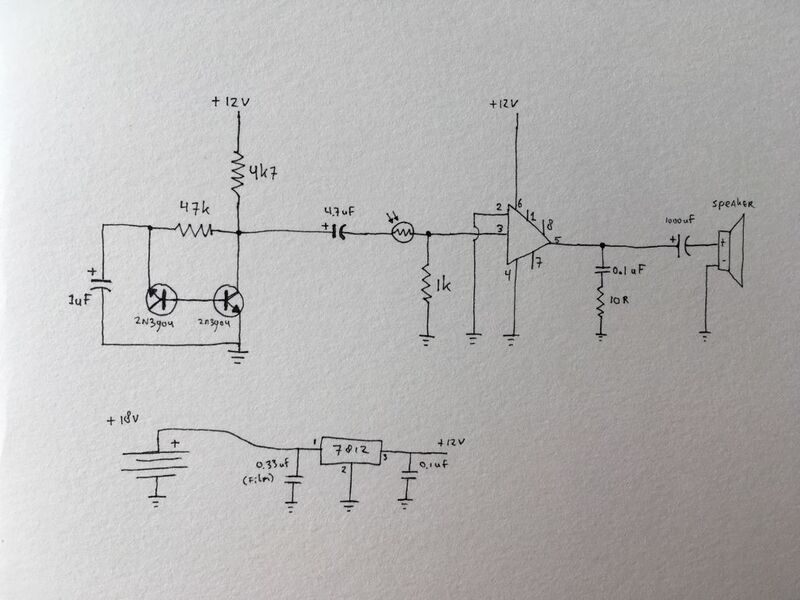 I'm trying to build a white noise generator that powers a 0.5 Watt 8ohm speaker. I want the circuit to be battery powered, I've have managed to build the two circuits I need for this separately but I'm running in to problem when I'm trying to combine the two. At first I powered both of them separately, white noise with 18 volts, and the amp circuit with 9 volt. I have the output signal from the white noise gping straight into pin number 3 of LM386. Ideally I want to use a photo resistor to control the volume of the white noise but this didn't work so far. I've had occasions that I didn't get any signal from the speaker, but did get a white nise signal when I would disconnect the input to the LM386. As if the signal was some how bleeding in somewhere else. My next step was to try and power everything from one source, this I did with a L7812. I connected two 470 uF electrolytes to GND on both the in and output pins of the L7812. With the output of l7812 I powered the LM386 circuit. This seemed to work, but was super loud. Putting a pod, a photo resistor or a regular resistor in for volume control didn't seem to work. 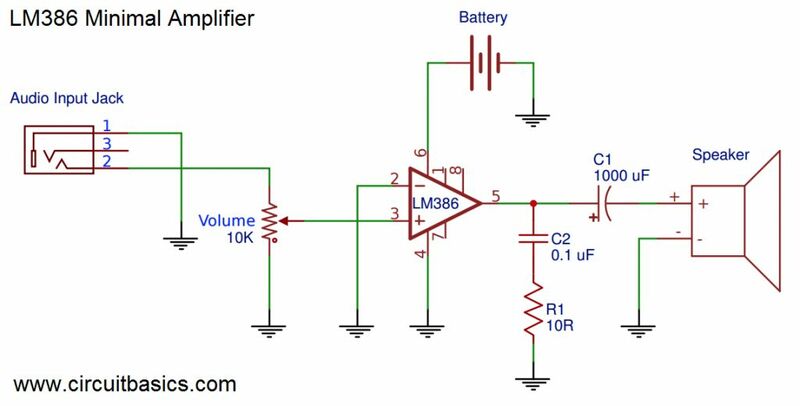 The dc voltage at the output of the noise circuit is many volts while the LM386 input expects a signal centered around ground so you need a dc blocking capacitor between the output and the input. A 2.2uF capacitor or larger should work. If you use an electrolytic capacitor, connect the positive side to the noise source. Thanks that has helped a lot. Still having trouble incorporating a photo resistor. Another issue I have is that the LM386 circuit only works properly when I remove C1 and R1. If their in place I get a high pitched tone into the white noise. I'm using 2x 470uF on the speaker output, not 1000 like in the schematic. I'm also wondering if I can go down with the caps I'm using for the L7812 regulator. At the moment it's two 470uF caps, but I feel this is way to much for what I'm doing. 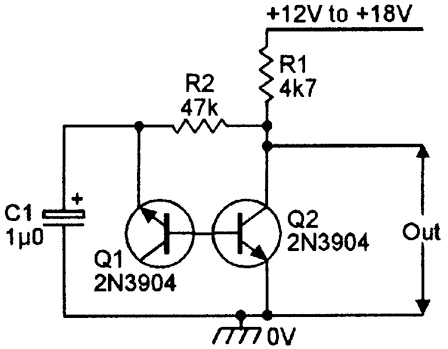 How does such a thing effect the circuit, does it just draw more current? Most datasheets for 7812 type regulators use 0.33uF at the input and 0.1uF at the output. I think the function is mostly for stability so it doesn't oscillate at a high frequency. Large electrolytic capacitors normally have a high inductance at higher frequencies and are poor decoupling capacitors and are better at supplying energy to the regulator and load than providing stability. In general, it is recommended to have a small capacitor in parallel with the large one if you have one as an energy reservoir. Is it correct that you want to use the photoresistor to increase the noise level when the light becomes brighter? If so, I would try to connect one side of the photoresistor to the negative side of the dc blocking capacitor and the other side to the LM386 input and a resistor to ground. 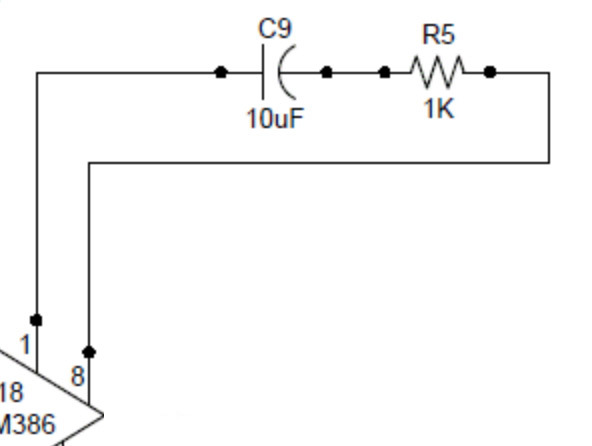 The photoresistor and fixed resistor will form a variable attenuator just like the potentiometer and the dc voltage at the input should be centered at 0V no matter the resistance in the photoresistor. The dc output voltage should also be centered at Vdd/2 independent on the light level so check that as well. Thanks that seems to work really well. I didn't have a ceramic cap of 0.33uF so I used a Film Cap but that seems fine, or is should I really be using a ceramic here. I've added the photoresistor as you proposed. I've measured the dc voltage at the input and that's 0.017 volt, the output has 0.012. I've used a 1K resistor and it kind of works but I get this oscillating effect at lower light conditions. I've uploaded a Video that shows this. Thanks so much for your help! I think it will be fine, but if you are worried you can always place a 0.1uF ceramic capacitor in parallel. Maybe someone else knows more? If you have a 1kohm resistor between the input and ground and you see 17mV across it, you have way too much dc current flowing in that resistor. Maybe you have a lot of leakage current in your dc blocking capacitor? If the output is only 12mV above ground, something is wrong. Are pin 1, 7 and 8 left floating and not connected to something? With the noise source disconnected from the LM386, measure the ac voltage after the 1000uF capacitor to see if you may have a high frequency oscillation that might be there but too high to hear. I think the RC network at the output that you removed might be there to prevent that, but now I'm starting to speculate. I have disconnected the audio output going towards the LM386 and I can still hear white noise coming out from the speaker. Only when I disconnect the current powering the white noise circuit this stops. I feel somehow this white noise is making its way into the LM386, maybe over the 12 volt lines? You can try to place a few uF between pin 7 (bypass) and ground to see if it helps to filter out any supply coupling. One circuit in the datasheet used a 10uF capacitor so that could be a start. The value of the resistor was 270 ohm, the value of the elco's was 100uF. You might try even higher values's e.g. 470 uF. Thanks! [/img]I've tried that now and also the added the cap and elco from the image below (mfos webpage) Sadly no success. So if I understand you right, noise reaches the LM386 only if there is no filter on the supplies between the noise source and amplifier as suggested by flagala but it doesn't matter if you connect the noise output to the amplifier input or not. Maybe there is something wrong with the LM386 chip itself. The dc voltages at the LM386 input and output you reported earlier still seems unreasonable to me and makes me suspect it might be faulty.